The committee manages both the Wyemando Bequest and the Jimmy Pike Trust. Dr Matt Byrne is an Associate Dean (Primary) for the School of Education at Edith Cowan University. Matt is an experienced teacher, teacher educator and researcher. He is involved in Aboriginal education and research and the development of cultural competency within the university, public and private sector. Matt is currently leading a number of research projects with Foodbank WA investigating the impact of Foodbank’s Healthy ‘Food For All’ Strategy on schooling which includes the School Breakfast Program. In collaboration with Monash and Charles Sturt University Matt in 2016 was a part of a successful Office of Learning and Teaching (OLT) Innovation and Development Grant ‘Engaging and partnering with Aboriginal and Torres Strait Islander parents and community to improve student outcomes’. Matt is also an Honorary Research Fellow at the Telethon Kids Institute (WA) working with Professor Donna Cross and the Health Promotion and Education Research group. Noel is a consultant accountant specialising in the Charity Sector. In this role he was the advisor to the Harper sisters who were the Founders of the Wyemando Harper Sisters Aboriginal Bequest. He is a frequent contributor at Seminars on matters relating to the Charity Sector on accounting and taxation, constitutional matters, legal structures, corporation and administration generally. He has taken a leading role in WA in the provision of guidance to charities with the introduction of the Australian Charities & Not for profits Commission (ACNC) and is a member of the ACNC Professional Advisor Group. He is a Fellow of CPA Australia with which body he holds a Taxation specialty. He is also a Fellow of Chartered Institute of Secretaries. Kaya. I am John Mogridge. I am from Bibbulmun Boodja. I have 4 Daughters and I have connection thru family links in Yamatji, Yaru and I am proud of my heritage as my knowledge keeps me positive and grounded. I have lived all thru Western Australia from Carnarvon, Port Headland Kununurra and Wyndham the later where I met more family. I have gotten to know my Culture from the South West and I am passionate about our young people needing to know who they are and where they are from thru culture. I have my four beautiful daughters and now two beautiful grandsons that will be learning all I know and more. I currently work for the City of Swan as a A.E.W and I am here to help people open their eyes to the richness of the Culture of the First People’s of this Boodja thanks for the inclusion to be a part of this group. Finn is an Architect, and a Director of Iredale Pedersen Hook Architects. He has been working in the Kimberley and Pilbara regions of WA since 1992. He lived in Broome for 5 years and worked for NBC Aboriginal Corporation designing and project managing housing projects and facility buildings for Aboriginal communities and is passionate about contributing to the improvement of conditions for Aboriginal families in Australia. Finn is a passionate environmentalist and a founding member of Environs Kimberley Inc, a Broome based environment group promoting landscape preservation and sustainable development in the Kimberley region of Western Australia. Brian is a Consultant Accountant to the Charity Sector, a member of CPA Australia and a board member of several charities. Prior to joining the board of Wyemando Bequest Inc, he was involved in advising the board for several years. He retired from full time work as an accountant in the commercial sector in 2013 with over 30 years of experience handling reporting, financial control and taxation matters. He has a sound knowledge of BAS, GST, FBT and PAYG, together with State taxes (Payroll Tax and Stamp Duty). Brian has had significant involvement in the Charity Sector before retiring, including Church Treasurer, former Chairman and Board Member of Baptist Churches Finance Board. He has also been involved in other denominational activities. Coleen Sherratt is a proud Noongar Wadjak person. She currently works for the Department of Education as a Project Officer for Aboriginal Languages. She is responsible for the coordination of Aboriginal Languages in Western Australian public schools in the Mid west, Metropolitan, Wheatbelt and South west areas. In this role Coleen also co presents the Aboriginal Languages Teacher Training Course for speakers of their traditional languages who work in schools. This course provides the participants with the skills necessary to teach their languages in classrooms. Previously Coleen worked in schools for 12 years firstly as an Aboriginal and Islander Education Officer then Noongar language teacher before completing her Bachelor of Education at Curtin University. Hiroko is a proud Yawuru and Karajarri woman from Broome. She holds a Bachelor of Education degree and previously worked as a primary school teacher for 12 years, teaching in various schools in the Kimberley. Having also completed the accredited Aboriginal Languages Teacher Training Course with the Education Department of WA, Hiroko has been teaching Yawuru for five years with some experience in providing support to other Aboriginal language teachers in the Kimberley. Hiroko is currently a co-facilitator of the Walalangga Yawuru Ngan-ga program, an intensive Yawuru language immersion course based at Mabu Yawuru Ngan-ga, the Yawuru Language Centre at Nyamba Buru Yawuru Ltd, Broome WA. She is also a Yawuru Language Teacher at a local Broome school. Hiroko is passionate about revitalising Aboriginal languages as she sees the importance of keeping language and culture alive. Cameron grew up in country WA – Kondinin and Kalgoorlie, and now lives in the city with his family. 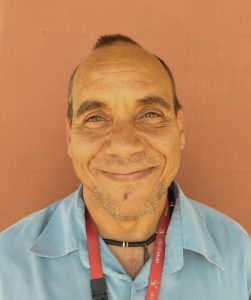 He teaches in the Community Development course at Murdoch University and in the past has worked as a primary school teacher in the Tjukurla community in the Ngaanyatjarra Lands, and as a community worker in schools in Perth. He holds a Bachelor of Arts in Education and a Masters in Community Development, and has worked in schools, universities and community organisations for over 20 years. Outside of work, he enjoys walking his dog Arthur, growing vegetables, playing the banjo and generally being outdoors. Originally an architect, I moved into the community sector, working for several not-for-profit organisations and completing a Post-graduate Diploma in Community Development before joining Wyemando in 2012. I’m fascinated by languages and how they describe our world view. My understanding of this boodja (country) has transformed since I started learning Noongar language in 2011 and going on bush trips on led by a local Noongar elder. Also project officer for the Jimmy Pike Trust, I work part-time and I’m generally available to respond to calls and emails on Mondays and Tuesdays.